Didn’t get what you were hoping for on Valentine’s day? Ask your sweetie to make it up to you by buying you one of these! Are you Happy? Sleepy? Bashful? Sneezy? Whichever of the Dwarves you are at heart, you can now represent all seven with this ring from Disney Couture. 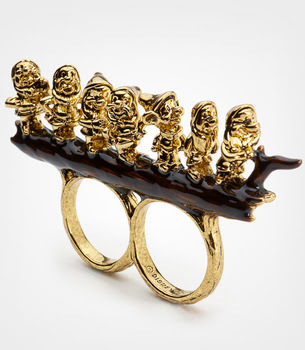 Antique gold double finger ring features mini figures of all Seven Dwarves. Available in sizes 5/6-7/8. 2.5″ long, 1″ tall $55.